If you’re heading to Costa Maya Mexico on a cruise, you need this guide for What to Do In Costa Maya Mexico (Malaual) On a Cruise – from where to eat and drink, to sights, and a golf cart adventure to a restaurant over the water where you can eat fresh from-the-sea fish tacos! I was invited to tour the Crown Princess on a five day cruise through the Caribbean – where ports are open and ready for tourists! 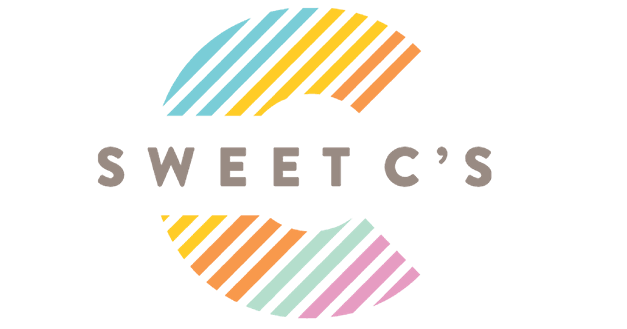 While I am proud to have Princess as a sponsor of Sweet C’s, as always, all opinions are my own. I do receive a small commission when booking your cruise with Princess by clicking the links in this post – at absolutely no cost to you. For the best deals on your own Princess Cruise, please click the banner button below! 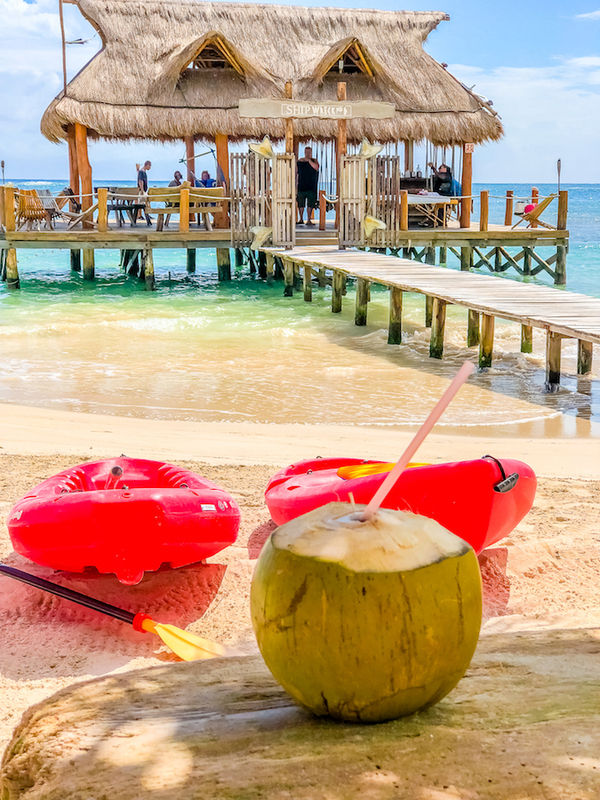 Princess, and their parent company, the Carnival Corporation, are proud to spotlight Caribbean ports post-hurricane season, and are committed to restoring tourism to Caribbean towns – which makes this the perfect time to plan your own Caribbean cruise! When planning a Carribean cruise, Malahual can pose a couple of interesting questions. Quintana Roo is full of raw, natural beauty, sugary-soft sand beaches, and light turquoise blue water that softly laps against the shore – as well as tons of ancient ruins, natural attractions, and great food. Malahual is a cruise port built just a couple miles from the tiny town of Malahual (not far from the border with Belize), offering a wide variety of options for cruisers – but it’s not as big as other ports, and leaves a lot of people wondering what to do when in port! There are a TON of awesome shore excursion opportunities, and I heard fantastic reviews of all of the opportunities my friends checked out. The Costa Maya port is also a huge modern hub of activity – with pools, dolphin shows, restaurants, tons of shopping, and a replica Mexican village right there to be explored just steps from your ship – no planning needed. My friend Rebecca from Sugar and Soul and I decided to make our own excursion and rent a golf cart – and head out to explore! The following is our guide to a perfectly relaxing, fun, and adventurous day in Malahual. Check out the port and tour the replica Mexican town while others are grabbing poolside chairs or heading to their excursions. The Costa Maya port can get PACKED when people are exiting the ship – but most people who head off right away are either set on getting a prime chair by the pools, or are heading to their pre-arranged shore excursions. If you’re not doing either of those, I’d beeline it for the Replica Mexican village in port (just behind the main vendors – there are signs everywhere to direct you, but you’ll see the bright paper flags and cute cobblestone details and know you’re there!) before everyone else fills in later in the day for the best views, more space, and a more relaxing time. Hit it first while everyone is waiting in line for busses and you’ll maximize your day! Rent a golf cart and head into Malahual. 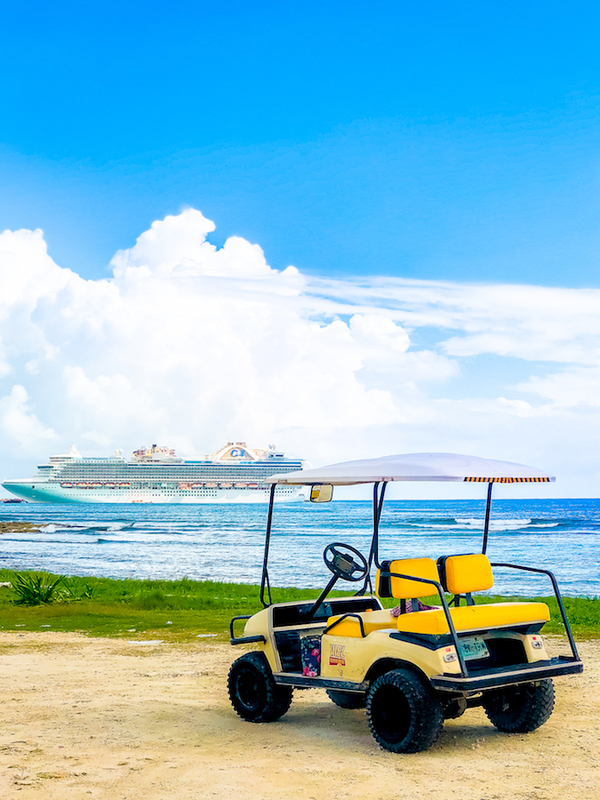 Golf carts are available for rent just behind the busy port – follow signs to transportation in the port area. Golf cart vendors only take cash – but will accept pesos, dollars, euros – any major currency. If you don’t want to go all the way to Shipwrecked like we did, there are numerous choices in Malahual that looked perfectly relaxing and great. 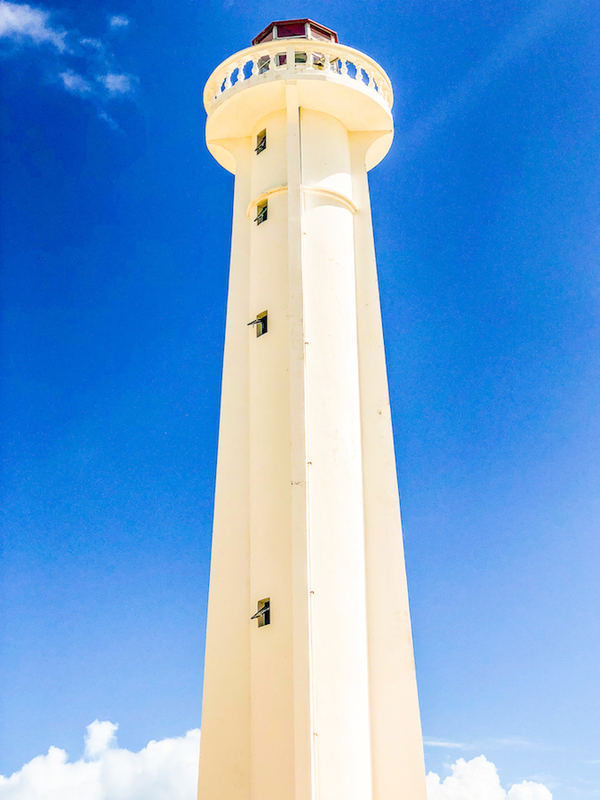 Check out the Malahual Lighthouse and take a picture with the swordfish statue. Tour town, grab fruit or pastries, and grab a snack. 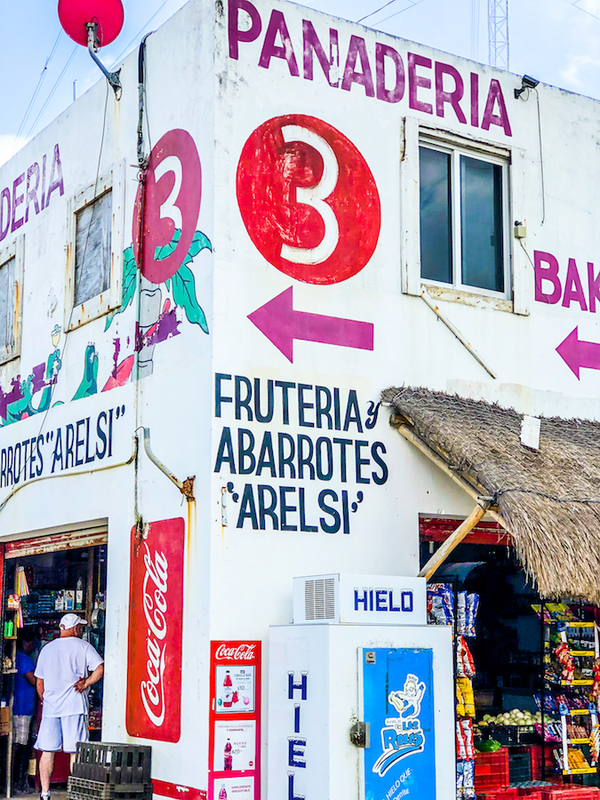 There are tons of Panaderias (bakeries) and Fruiterias (fruit stands) offering delicious, fresh, and unique items in Malahual – cash is key to buying here, but again, vendors will take any major currency. Be sure to have an app to calculate your conversion rate handy! I love the XE currency app. Drink coconut water fresh from the fruit under a big palm tree. Throughout Malahual, you’ll see men gathered with large knives and coconuts who will happily ask you if you’d like to buy a coconut, and then will slice it open for you and pop in a straw for the most delicious and incredibly fresh coconut water you’ve ever had. 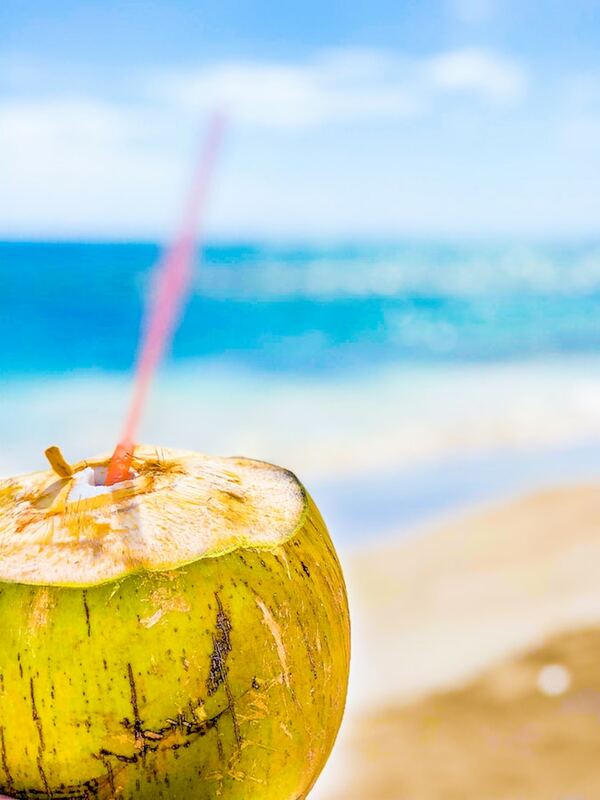 If you’ve been hitting the cruise bars a bit hard, that coconut water is pure life – it is completely refreshing, slightly sweet, and helps restore electrolytes and rehydrate you. It’s possibly one of my favorite things to enjoy in Mexico, ever – and from someone whose love language is tacos, that really means something! Head to Shipwreckd for from-the-sea fresh fish tacos. After looking over some reviews of local restaurants in Malahual, Rebecca and I decided to venture all the way out to Shipwrecked (friends who met us there later were really impressed we had taken the golf cart all the way about 3.5 miles down a dirt road in the golf cart (which might not sound far, but in a golf cart and on a rough dirt road, it definitely isn’t a short trek) – it is COMPLETELY off the beaten path, and is literally at the end of the road where there is a huge sign saying golf carts cannot go any further! Shipwreckd, as it turns out, is owned by an American ex-pat who was on vacation in Malahual and fell in love so much he bought the restaurant and beach club. There are some hammocks, loungers, and beach toys surrounding the slightly rustic beach club – but the top attraction is the over-the-water restaurant! We sat down and ordered fish tacos (my favorite) which we were instructed would be a while (would we mind waiting?) 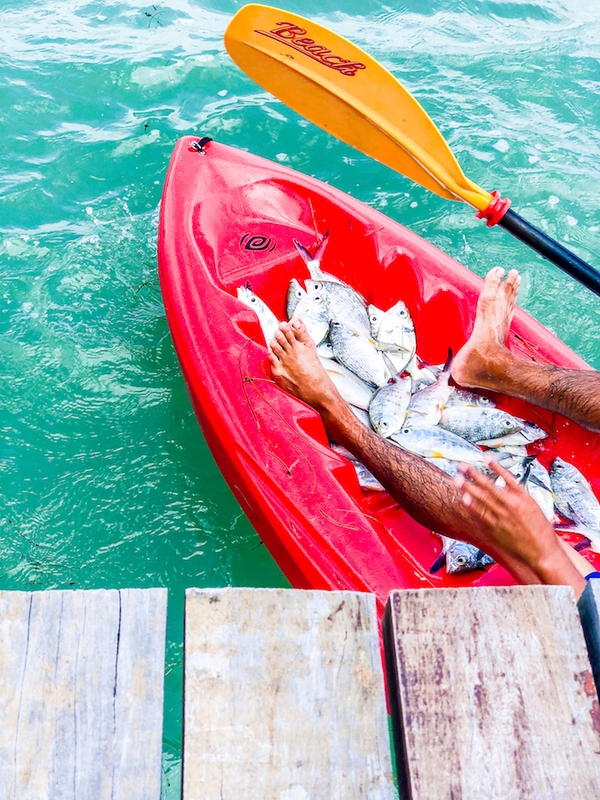 – as we realized there was a man in a kayak catching our lunch. Talk about fresh food worth waiting a little bit longer for! -You need transportation – town isn’t close enough to walk to from the ship. Golf carts, taxis, and other car rentals are readily available in port. -Malahual is safe. While Mexico has plenty of precautions tourists should be aware of (always drink bottled water, stick to well-populated areas, and keep your possessions close and wits about you), Malaual is a pretty safe town to explore. While we were met with lots of “want to come to our beach club” or “come look at these souvenirs” from vendors, we never felt unsafe or out of place. Malahual is a very small town, the kind of place everyone knows each other and tourism is big business – your safety is in their top interest. Stay close to port, stay out of trouble, and don’t get fall down drunk and you’ll be just fine. -Malahual is still largely undiscovered by big money tourism. 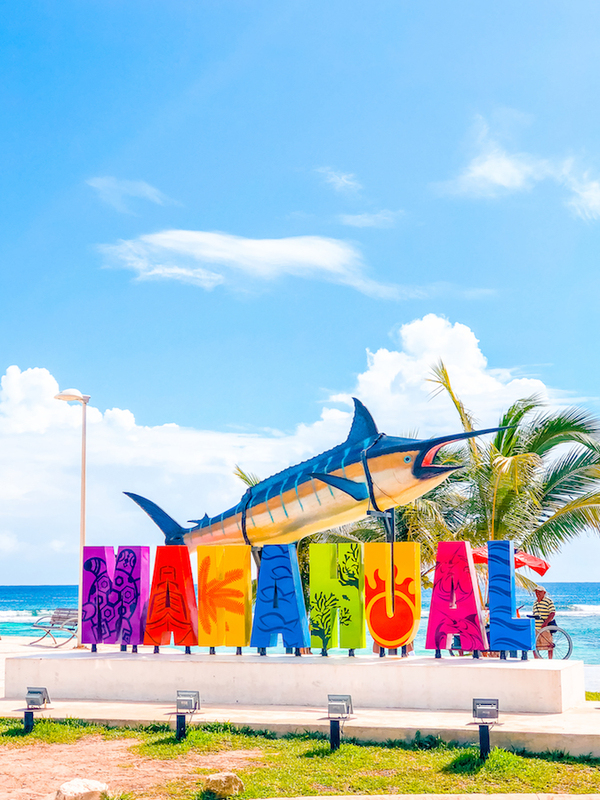 While the port is slick, sleek, and new – with very Americanized, comfortable, and luxurious outfittings, Malahual is far enough from Cozumel and Playa Del Carmen that a lot of big tourism businesses have yet to set up in Malahual (which I am told is changing by the day.) This means you’ll get a more authentic, funky, and less sterile vibe – which I love. It hasn’t been overcome by tacky tee shirt shops and neon signs – and is the epitome of chill and relaxing. It has a great small-town vibe, with great authentic and fresh food, bright buildings, and somewhat spotty maintenance for things like roads. It all adds to the charm – go with it and embrace getting to experience real Mexico! If you’re looking for a sterile experience, stay in port where there is a TON of stuff to keep busy! Book YOUR Mexico Cruise with Princess NOW! 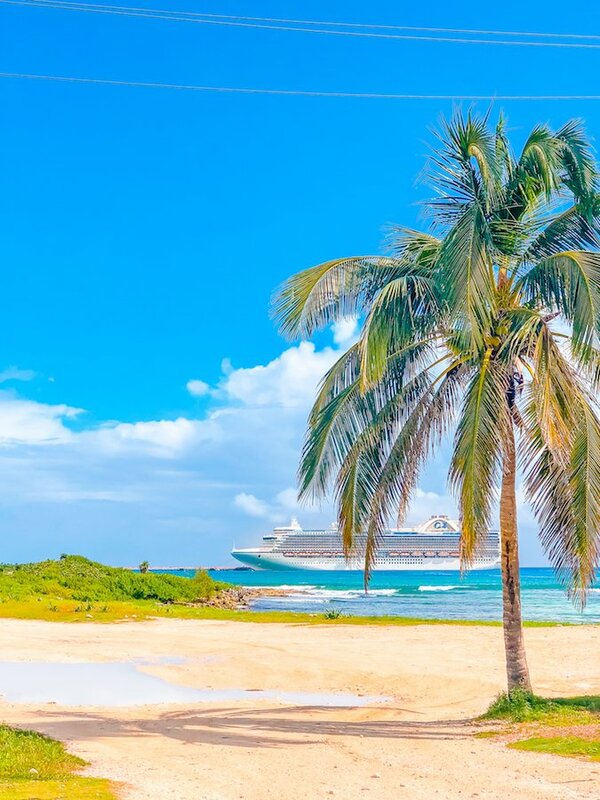 I absolutely love cruising with Princess – for their delicious food, friendly staff, laid back (but not too crazy) atmosphere, and the best itineraries and shore exclusives! For the best rates, be sure to click the banner below. I do receive a small commission at absolutely no cost to you, which helps offset the costs of running this site.